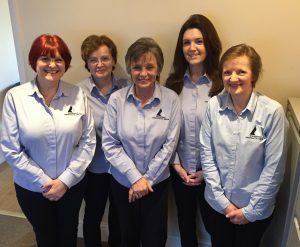 who are supported by our chiropractic assistants Donna, Judy, Julie, Suzan & Lesley. 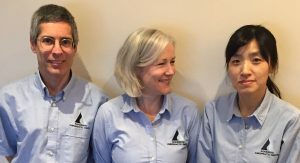 Patients frequently remark on how friendly our clinic is and this is reflection of the high quality of the team that we have working here at Wokingham Chiropractic Centre. Andrea’s continuing professional development is inspired by a search for the most effective solutions for her patients. She qualified from A.E.C.C. in Bournemouth in 1989 and then studied Sacro Occipital Technique (SOT). She passed the advanced SOT exam in 1995 and qualified as a cranial chiropractor in 2005. Since that time she has helped to teach these techniques to other chiropractors at post graduate level. She studied Applied Kinesiology, finding it useful to get to the root of some conditions. In 1998, Andrea qualified as a Pilates matwork instructor, an approach that she finds invaluable as a means to prevent problems from recurring. Although general family practice is her passion, she relishes clinical challenges that have proven unresponsive to other treatment approaches. She has worked with hundreds of children and babies over more than 20 years in practice. Her two sons keep her busy, whether it be cheering from the sideline at football matches, swimming, horseriding or dog walking. She still practises Pilates regularly. On completing a B.Sc.(Jt. Hons) in Physiology and Psychology at Cardiff University, Henry started at Chiropractic college in Bournemouth. Emerging with his Chiropractic qualification (D.C.) 4 years later, he realised with regret that his status as a perpetual student no longer applied. After gaining invaluable experience in other clinics, Henry established Wokingham Chiropractic Centre with Andrea in 1994. He enjoys the wide variety of general chiropractic practice with a special interest in the role that stress and psychoemotional factors play in the development of pain and dysfunction. Outside practice, he is kept busy by his two sons, Tom and Rob and by Jimmy and Bean the family’s lurchers. Jimmy also doubles as a personal trainer, barking to encourage faster cycling through the woods. Eunjoo was born in Seoul in South Korea. After gaining her first degree and masters in Chemistry, Eunjoo decided to become a chiropractor. She attended A.E.C.C. in Bournemouth and qualified after 5 years of study. After she graduated, Eunjoo moved to Stockport to join one of the longest established clinics in Manchester. Over the following 4 years she developed a passion and drive to help as many people as she could. Eunjoo has been continually updating her knowledge with research and seminars including those on Sacro Occipital Technique and Dry Needling to enhance the care that she provides for her patients. In her free time, Eunjoo enjoys a variety of activities including badminton,, hiking, cycling and travel. It is important for her to keep moving and refreshed from all stresses. Eunjoo is excited to be able to help people to discover the vital energy that resides within each of us. She believes that chiropractic is about helping people achieve their full potential in health and all areas of life by means of maintaining optimal spine and nerve function. Krishna graduated from the A.E.C.C. in Bournemouth in 2008, she won the award for the most holistic student practitioner of the year in her final clinical year. Over the years in clinical practice, she has developed her skills and uses a range of chiropractic techniques, including Sacro-occipital techniques, Diversified, Activator, and Taping. She is also trained in a western form of acupuncture called dry needling, which can be a highly beneficial additional treatment when working with muscle tension and trigger points. Krishna’s goal is to provide the best care for her patients and she does this by promoting a healthy lifestyle and good posture. Krishna enjoys treating people of all ages, but her passion lies in providing chiropractic care to babies and young children. 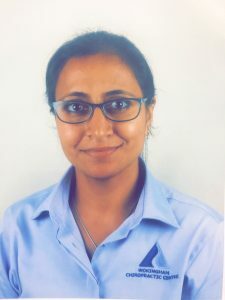 Krishna is a mum to two young children and constantly sees at first hand the physical stresses on a growing child’s spine and nervous system from falls and playground bumps to heavy school bags and sitting all day in the classroom. Chiropractic care provides a gentle but effective approach to growing healthy and happy kids. Outside of clinic, Krishna is actively involved in the local school community, she has visited the school to educate kids about the spine and good posture. Her hobbies include cooking, walking and hiit (high intensity interval training) exercise. Since having her 2 children, she has rediscovered her love for yoga and practices yoga daily, her kids join in and get involved too.